SACRAMENTO, Calif. – April 16, 2015 – e.Republic’s Center for Digital Education (CDE) has announced the results and winners of its Digital Community Colleges Survey. 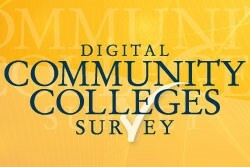 In its tenth year, the survey analyzes how community colleges use digital technologies to improve services to students, faculty, staff and the community at large. Findings include: 58% support student job placement through online resume-building tools, 43% have strategies in place for the use of mobile devices and 81% of colleges surveyed use cloud computing services resulting in cost savings. Northern Virginia Community College, Va. (10,000 students or more) NVCC’s online “campus,” the Extended Learning Institute, provides two fully online AS degrees, online advising, proctoring, and extracurricular activities in order to ensure that online students have a full collegiate experience, even if they never go to a campus. Examples include the virtual student union and an online “transfer fair” with “break out rooms” for each participating college. With free digital materials also available, students enrolled in online courses have saved over $800,000. Lord Fairfax Community College, Va. (Between 5,000 and 10,000 students) LFCC planned ahead years ago and built a fully-scalable, upgradable wireless network to support students and guests – before the mobile boom. This has served students and faculty well in providing digital content and courses. Accessible IT infrastructure is the college’s first priority, and best practices for security measures have been implemented to protect the data. Carl Sandburg College, Ill. (Up to 5,000 students) CSC launched the Open Education Resource Course Initiative (OERCI) last year to provide support and opportunities for faculty to use open education resources in their courses. This has saved students $130,000 to date by reducing textbook requirements and increasing the number of textbook-free courses. Mobile devices are encouraged and used campus-wide; the sciences department utilizes 3D and 4D apps and the college has a 3D printer for student and faculty use. All accredited U.S. community colleges are eligible to participate in the survey within three classifications based on size of enrollment. View the full list of colleges honored. CDE is a division of e.Republic, the nation’s only media and research company focused exclusively on state and local government and education. www.erepublic.com.